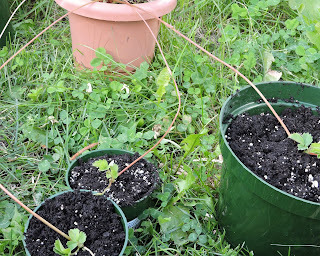 The photo above is some Tristans that I potted off runners from my original pot of Tristan strawberries. I actually had 2 runners, but gave my brother one when I realized the pot of French strawberries I was going to give him had several runners coming off of it. Since he's planning to plant a lot more strawberries for his granddaughter, I told him I'd write up a tutorial on how to handle the runners. So first things first- a plant that is sending out a lot of runners is putting energy into that, and won't set as many flowers or berries. 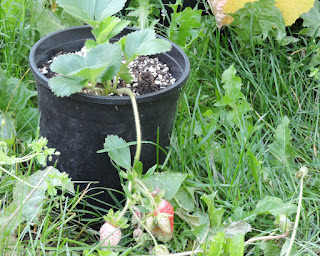 So if you want a plant bearing a lot of fruit, you want to cut off the runners as soon as you see them. 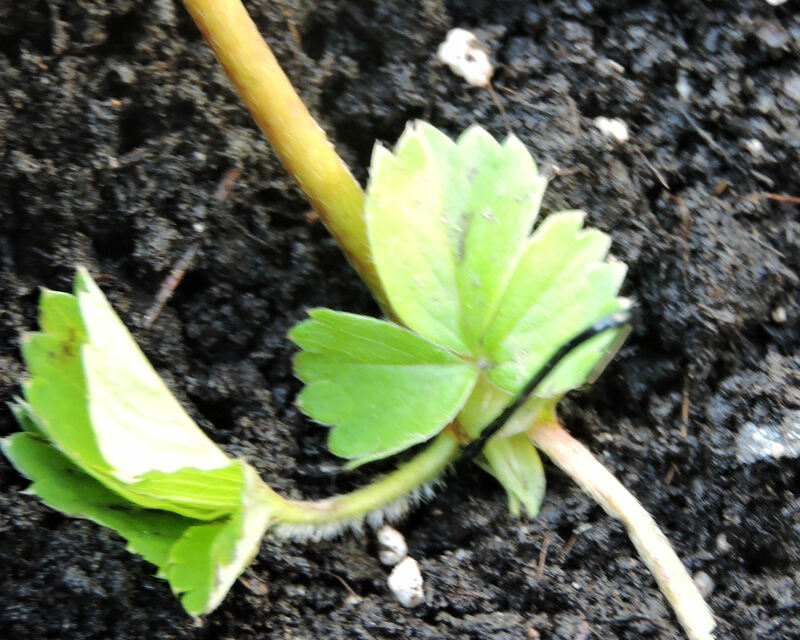 But strawberries need to be replaced every few years, so the best method to keep them going is to have mother plants to make babies, and have some of those babies be next year's mother plants. Nature does this all on it's own with wild strawberries, but since it's your garden, container or otherwise, you probably want a little more control over the process. Also in cases like my precious Tristans- they do better in pots, and with pots I can overwinter them under my porch so they don't get as cold. 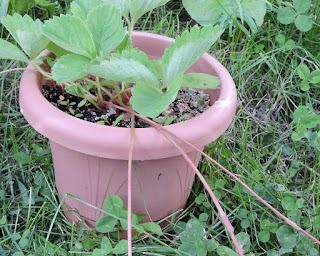 The runners are the long bare stem like things coming out of the pot. A couple inches from the end of each of these is a node, like a little elbow in the stem, that will have a couple leaves on it. That's what you want to plant. Sometimes they will have roots starting when you catch them, sometimes they won't. This pot is full of organic soil, compost, and a bit of perlite to keep the soil mix light and easier to lift and to help drainage. I use perlite or vermiculite in all my pots to make them lighter, and as I switch out pots, dump that soil mix into my raised beds to make up for erosion and also to help keep the soil in my beds from getting too compacted. This is a node with some roots starting. Now what you want to do is anchor that node in the pot. 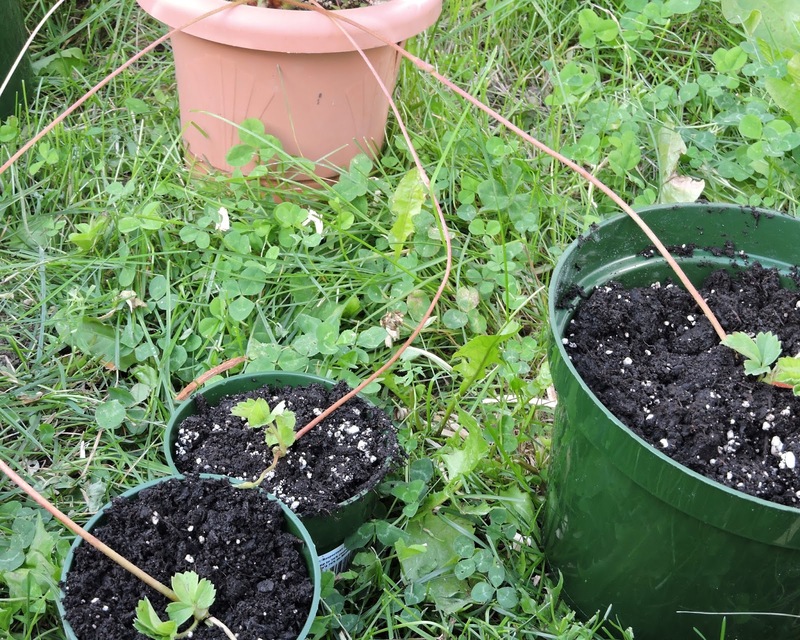 In my beds, I've used small pebbles to do in the past, but for pots, I usually go with a hair pin. Easy, cheap and I always have a lot of them on hand. 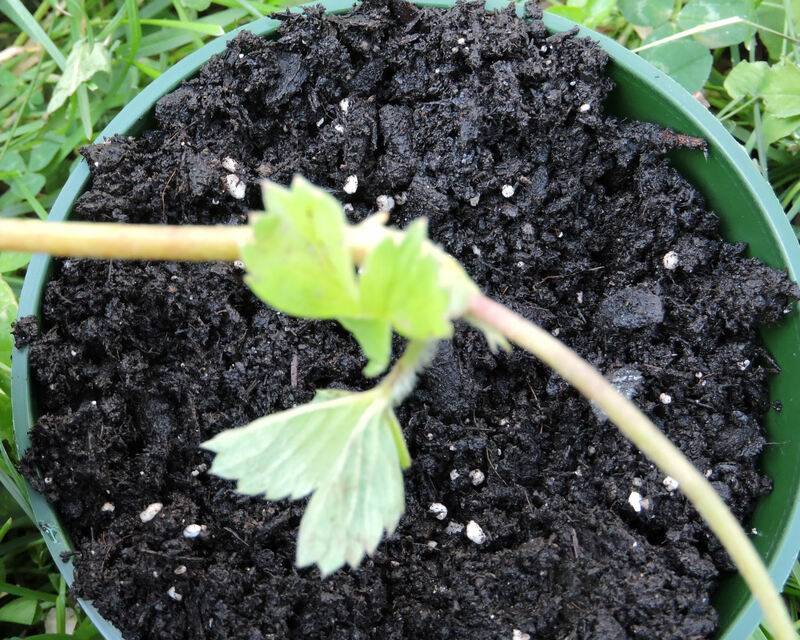 So if the node has roots, I'll dig a small hole and put it in then sweep some of the soil over them. Otherwise, I just pin the node in place. In a week, I'll check to see how they are doing. 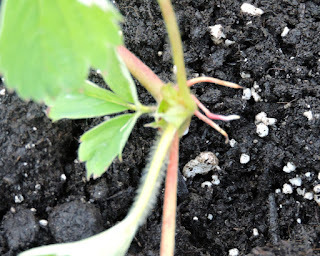 The one that had roots already should be ready to cut the runner at that point. The rest may or may not be. If it looks like there is a fair amount of growth- and they do grow fairly fast once they are rooted, I'll cut all the runners. In the spring, feed the pots, or pot up to a bigger pot if you think the soil is exhausted and watch your strawberries grow!